Are some banks in Monaco a bit too grand? They could be out of money. It happens. I wonder if they let people use their restrooms? :-) I agree with Steffe. I would think that a bank would make change for anybody. Hopefully the bank does have some cash on hand? Mebbe, mebbe not! Credit cards only. American Express will do nicely thank you! 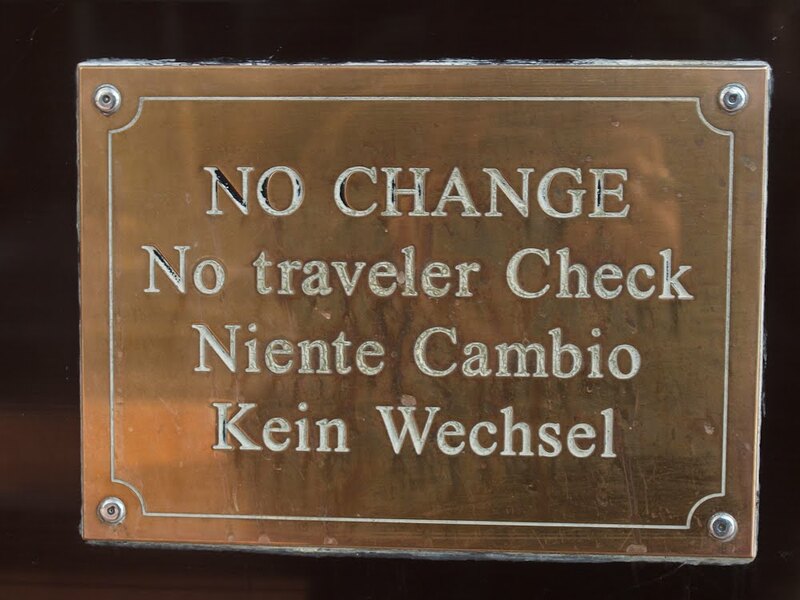 But why not in French, too - no pas de change? I guess Francophones are supposed to just know this naturally, while speakers of English, Italian and German are tourist dummies who require notice. I know just a iddy biddy bit of French. It really helps that I try to speak French when we're in your country, even if I butcher it. Your countrymen think I'm cute, earnest and helpless. Then they go out of their way to help me.